Yesterday on Twitter Piers Morgan caused a ‘storm’ with this tweet. 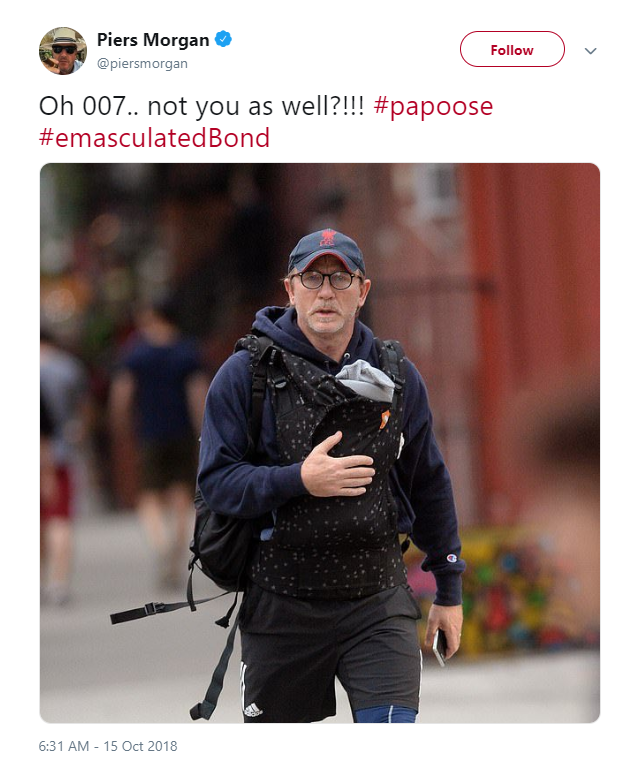 Contrasting 007 with the actor who plays the part and directly inferring that his behaviour (carrying his daughter in a sling) was in some way not masculine and at odds with his most famous role. If I’m being honest, I’m of the opinion that Piers Morgan and that other delight, Katie Hopkins, are to a large extent professional wind up artists. It’s a role they play on social media. However, as John Adams points out in his excellent blog when someone with an audience, a profile and the opportunity to shape opinion expresses views which have the potential create a negative effect on society, then it’s absolutely right that those views are challenged. There are enormous benefits for children when Fathers are hands on in their lives and while we are slowly moving towards a situation in western society where being a hands on Dad is becoming normalised and aspirational, there is still a long way to go. Masculinity comes in many forms and it’s important that young men and women see and celebrate that part of masculinity that is being an active and involved Dad. Until we have true equality in parenting it remains important to brave the shouty nuance-free opinions on social media and continue to challenge those views that imply that caring for your children makes you are less of a man. Work life balance getting in the way of being a great Dad? maybe you need our free guide? Newer PostYou can have better work life balance!